Alopecia and hair loss are a common hair problem amongst people of all ages. Be it teenagers, adults or people in their 50’s or 60’s. Are you also suffering from constant hair loss and the ever-degrading self-esteem? Are you looking for ways to naturally combat hair loss? Well, if you are, then there is excellent news for you! Several natural hair oils promote hair growth, combat the problem of hair fall and enhance the overall quality and appearance of your hair. These top 20 oils can also prove to be beneficial for you in case you are suffering from scalp problems, thinning of hair, dandruff and other related hair issues. If all else has failed, trust these top hair oils to ensure long, healthy and glossy hair in addition to assisting in quicker hair growth. Let us check these hair oils and learn about them in detail! Castor oil is full of essential nutrients such as minerals, proteins,and Vitamin E. It works like magic on a scalp that is afflicted with constant hair loss. Moreover, its antimicrobial properties aid in getting rid of all kinds of scalp issues such as dandruff. It is interesting to note that castor oil naturally softens hair by moisturizing it and ensuring that the normal moisture level is maintained in the hair. The best ingredient of castor oil is ricinoleic acid as it treats the scalp for all kinds of hair diseases and inflammations. The main reason why castor oil results in quicker hair growth are because it helps in the easy circulation of blood on the scalp. It is especially good for treating dry scalp because of its moisturizing properties. To best use castor oil, massage it well on the scalp and hair and wash your hair with a mild shampoo, leaving it overnight. The secrets of olive oil are known to all. It is not only a great addition in your favorite dishes but is also rich in Vitamin E and contains high moisturizing properties. In addition to that, it contains a substantial concentration of antioxidants which is not just good for the hair but also the skin. Furthermore, olive oil is extremely lightweight and consists of oleic acid that facilitates easy penetration of the oil into the hair shaft and ensures that the moisture is locked inside. What is great about this oil is that it also acts as a natural conditioner to promote smooth and evidently soft hair provided you use it regularly. If you have dandruff issues that further cause increased hair fall, olive oil is a boon for you because of its anti-inflammatory properties. Massage it into your scalp thoroughly and leave it overnight for best results. Sesame oil is often a key ingredient in several Ayurvedic preparations that are meant for hair growth. It is also added to Bhringraj oil to enhance its hair growth properties. This oil is antimicrobial in nature and hence, helps in the treatment of a lot of fungal infections and scalp infections. The best technique to use sesame oil is through a hot oil treatment because,in this way, you can ensure deep nourishment of your hair due to the oil penetrating deep inside the hair follicles. It nourishes the scalp, conditions the hair and also helps in getting rid of dandruff issues. And wait! That’s not it! The presence of vitamin E in sesame oil substantially boosts hair growth. Argan oil can definitely be considered as one oil that has taken the art of hair care by storm! Saying that it is a miraculous oil to promote healthy hair is an understatement. It deeply nourishes, moisturizes and hydrates the hair by penetrating into the deepest layers of the hair shafts and providing it thorough nourishment. What’s more? Argan oil is a treasure box full of antioxidants that help in repairing damaged and dead hair. What makes Argan oil stand out is the presence of vitamin E and vitamin F that assist in repairing damaged hair and giving them a shiny and lustrous appearance. This is precisely why Argan oil is the perfect way to get rid of stubborn split ends. It is popularly known as liquid cold for its wondrous properties on hair. Finally, if excessive heat styling has damaged your hair, argan oil is the way to go! Jojoba oil is not just advantageous for the hair but also works wonders on the skin. It has intense healing and moisturizing properties. Using jojoba oil regularly ensures frizz-free and lustrous hair. If you are looking to boost hair growth, you could not find a better oil than jojoba oil because it helps in the growth and enhancement of new hair cells. In addition to that, it successfully annihilates dandruff and as a result, reduces hair fall. The best quality of jojoba oil is that it deeply nourishes the hair follicles without leaving any trace of residue. Also, it aids the hair cells in reproducing themselves at an unbelievable pace. Coconut oil is not just a staple in the South Indian cuisine but also the main secret to the lustrous hair of the women in that region. It is the best hair oil if you wish to make your hair soft, lustrous and healthy. Coconut oil is packed with antioxidants and vitamin E which is why it acts as a natural conditioner to repair damaged hair. It is known to stimulate hair growth, penetrate deep into the hair follicles and moisturize dry hair. It also assists in making the hair softer and preventing split ends and hair breakage. Coconut oil works wonders if you add herbs such as curry leaves, Brahmi, Bhringa and other essential ayurvedic ingredients to it. Then, it turns into a miracle oil that is capable of curing all kinds of hair damage and helping the hair to grow at a faster pace in a very short period. Lavender oil has a refreshing and sweet aroma. The leaves and stems of lavender induce camphoraceous notes which are further softened by the unbelievable sweetness of the lavender flowers. Using lavender on the scalp through a massage therapy brings about a deep sense of relaxation, promotes hair growth, prevents hair loss and enhances blood circulation. Furthermore, it is a very potent moisturizer, antiseptic and antimicrobial. It deeply moisturizes the scalp, appropriately balancing the production of sebum. Its healing properties make it an ideal oil for people who suffer from dandruff. The best way to use lavender oil is by massaging it deeply into your scalp. This not just helps your hair but also helps you in getting a good night sleep due to its natural calming properties. Rosemary oil is an essential oil,and it has a very powerful effect on hair. It is one of the most pungent and freshest oils you can find with a woodsy and minty scent. Its aroma is deliciously herbaceous and instantly youthful. It is packed with a lot of antioxidants that help in preventing the thinning of hair and graying hair. It also boosts blood circulation which is why it is ideal for hair growth and the stimulation of hair follicles. Moreover, it significantly tones down the production of sebum which is why it is perfect for a greasy scalp. It also provides immense relief from dandruff and itchiness in the scalp. The best way to use rosemary oil is by mixing it with olive oil and undergoing a hot oil treatment by massaging the blend in your scalp and later wrapping your hair in a towel dipped in very hot water. Thyme is a very popular herb with small and intensely aromatic leaves. One tip in buying thyme oil is to ask for thyme linalool because of its miraculous skin softening properties. In the same vein, don’t go for red thyme because it consists of thyme oil that can irritate the skin. Thyme oil rejuvenates hair follicles and enhances the flow of blood to the scalp, thus, promoting hair growth. It is a common ingredient in hair products and shampoos that claim to prevent hair loss. For best results, mix thyme essential oil with extra virgin olive oil and lavender essential oil. Thoroughly massage this blend into your scalp and let it nourish your hair for a good 20 minutes. Later, shampoo is out! In layman’s terms, peppermint can be called as a hybrid of water mint and spearmint. However, it is definitely the most pungent of all. Peppermint oil has a powerful and cooling menthol aroma with sweet and clean top notes. It greatly enhances blood flow in the scalp and helps in the rejuvenation of hair follicles as well as the stimulation of hair growth. It performs a deep cleansing action on the scalp that helps in unclogging pores and enables the regular flow of skin cells, making it ideal for a dry scalp. However, take note that peppermint, because of its high cooling properties, can sometimes cause skin irritation to some people. Therefore, it is best to do a patch test initially before using it full on! The best way to use peppermint oil is by blending it with warm coconut oil and lavender essential oil. The clary sage plant is called the king of sage plants because it produces tall spikes of pink and lilac flowers that have an extremely musky and potent aroma. It also has notes of a woody-sweet and nutty scent. Clary sage is very popular because it has a high content of Phytoestrogen which helps in hair growth and reverses premature balding. Moreover, when you massage clary sage oil into your scalp, it controls dandruff and normalizes the production of oil in the scalp. It is also perfect to manage frizzy or curly hair. Please note that you should avoid clary sage oil if you are pregnant because it can induce contractions. For best results, mix 10 drops of clary sage oil to 2 tablespoons of coconut oil. Later, massage it into your scalp, coating every strand, leaving behind shiny and soft hair. There has been ample research regarding the powerful anti fungal and antimicrobial effects of tea tree oil. It has a fresh medicinal and pungent aroma with sweet and goody under-notes. It is a crucial element in a lot of dandruff treating products because it helps in relieving drying and itching and moisturizes the scalp. Tea tree oil begins by working itself very deep into the hair follicles. It helps unclog the pores, allowing a natural flow of sebum. Also, it is quite popular for its antimicrobial properties, thus resolving the issues of scalp acne, fungal infections,and bacterial growths. You can use tea tree oil with a sweet almond carrier oil for best results. Ylang Ylang basically means “flowers of flowers.” It is a tropical tree that comes with three types of flowers – pink, yellow and mauve. It has a long-lasting sweet and musky aroma with sharp top notes. If you have an itchy or dry scalp because of an inadequate production of sebum, ylang-ylang oil is perfect for you. Therefore, it helps in avoiding hair loss, hair thinning and brittle and thin hair. Ylang Ylang oil helps in naturally stimulating the production of sebum and moisturizing the hair and scalp. It is also very handy in removing head lice and is a safer alternative to other kinds of products that contain pesticides. For best results, blend YlangYlang oil with coconut or olive oil and use it as a hot oil treatment. Cedarwood Oil has a woodsy and warm scent. It is awesome for dandruff control and treating hair loss. A recent study even went on to claim that blending cedarwood oil with thyme, lavender,and rosemary can successfully reverse alopecia areata. Cedarwood greatly promotes hair growth by balancing the glands that produce oil in the scalp. This warming oil also enhances blood circulation resulting in vigorous hair growth. What’s more? Its antiseptic and antibacterial properties successfully treat the buildup of dandruff or other fungal problems. For best results, mix cedarwood oil with coconut oil and gently massage your scalp with the blend. Alternatively, you can also mix it with your shampoo for optimum results. Helichrysum is a part of the plant family of Asteraceae and is mainly found in the Mediterranean region. It has been used for decades due to its medicinal properties. It has strong capabilities of reducing inflammation due to its inflammatory enzyme inhibition, strong corticoid-like effects,and radical scavenging activity. It is a regenerative oil for all tissues of the body. It supports sebum production, healthy scalp tissue and improved blood flow to the scalp. As a result, there is an enhanced nutrient and blood flow to the hair follicles that increase the rate of hair growth immensely. For optimum results, mix four drops of Organic Helichrysum essential oil with five drops of lavender oil and four drops of rosemary oil. Gently massage it in the scalp and leave it overnight to see the enviable hair of your dreams. The horsetail plant consists of silica that promotes stronger nails and hair. The extracted oil of horsetail is also a popular remedy to treat dandruff and split ends. The best way to use horsetail plant oil is to mix it with other essential oils for thicker and problem-free hair. You can start by adding a couple of drops of the horsetail plant oil to extra virgin olive oil or coconut oil. Gently massage this blend into your scalp and hair and let it rest for at least 20 minutes. This will ensure that the horsetail oil reaches to the deepest hair follicles in your hair and enhances blood circulation. This is an excellent environment for the growth of your hair,and it nourishes the hair follicles deeply from within. Apricot seed oil consists of omega-9 fatty acid and oleic acid. Therefore, it is a fantastic emollient, making the scalp more pliable and softer. It increases the level of hydration in the scalp and reduces dryness. The linoleic acid in apricot oil also helps in avoiding excessive moisture loss, thus, providing ample lubrication to the scalp. The best way of using apricot oil is by adding a few drops to your favorite conditioner or shampoo to impart extra moisture and softness to your hair. You can also massage it as a pre-shampoo process to remove stubborn tangles. Another way to use apricot oil to the best advantage of your hair is by massaging it deep within your scalp which helps get rid of dryness and itchiness in addition to providing a soothing scent for the senses. Sunflower oil comes with a plethora of benefits such as improving scalp help, stimulating hair growth, acting as an emollient and eliminating frizzy hair. It has high amounts of vitamin E. As a result; it helps in the reduction of bacteria in the scalp that contribute to dry scalp and product build up. In addition to that, sunflower oil is a natural moisturizer because it is infused with minerals and several vitamins that promote healthy hair growth. In winters, when your hair tends to lose its natural moisture and becomes frizzy and unmanageable, sunflower oil comes as a lifesaver! It helps moisturize the hair instantly and adds softness and shine throughout your hair. Sunflower oil also prevents water loss because it is a light, non-polar solvent like jojoba oil. It has a light texture which is why it retains moisture and penetrates deep into the hair shaft. It is also odorless,so you don’t have to worry about any unpleasant smell. There are many online myths about avocado oil. However, here we will share with you exactly why avocado oil is a boon for your hair. Avocado oil has a high content of mono-saturated fatty acids which is even higher than extra virgin olive oil. This is the fundamental reason why avocado oil is excellent for your hair. In today’s day and age, having damaged and dry hair due to poor nutrition, chemical treatments, heat styling and environmental pollution is quite common. This is where mono-saturated fat moisturizes, strengthens and nourishes hair strands, providing a kind of hair mask and protecting the scalp from damage. When you massage avocado oil into your scalp, you also stimulate the flow of blood to the hair follicles. This ensures that a lot of nutrients reach your scalp, thus, stimulating new growth. 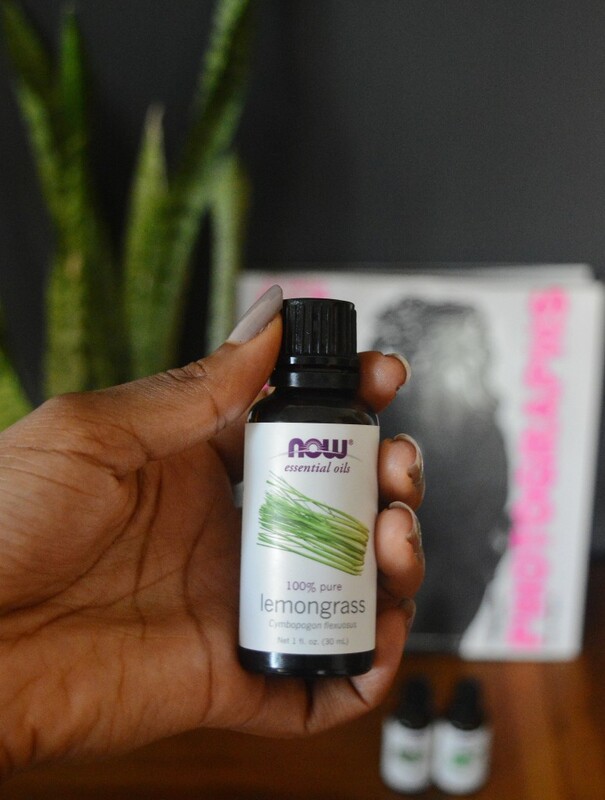 Lemongrass oil has a lot of healing properties,and it works wonders as an effective deodorizer and a cleanser. It assists in strengthening the hair follicles and helps in soothing irritated and itchy skin. The biggest advantage of using lemongrass oil is that it is a natural bug repellent and it helps in relieving stress which is the most significant cause of hair loss. It also detoxifies your hair and provides it with optimum health. Lemongrass can be your secret companion to attaining thick and long hair. For best results, mix lemongrass oil with lavender oil in order to create a powerful formula for strong and gorgeous hair. It cannot be argued that hair is an important part of your body. Hair loss not only lowers self-esteem but also gives a huge hit to your confidence. Therefore, in order to avoid embarrassment and social stigma in addition to boosting healthy hair, you must definitely make these natural and essential oils a regular part of your hair care regimen. These oils are not only wonderful for your hair but come with many other positive attributes for your physical and mental health. Hence, do not hesitate from using these oils daily for optimum results. You can either buy them from reliable stores or make them at home from online recipes.